Just FYI: if you tried to access my websites last night sometime beginning at 1:15am UTC, you might have gotten nothing in return. I found an email in my inbox this morning from my webspace provider that the server my sites are hosted on developed a sudden hardware fault and had to be swapped out, causing a downtime of a couple of hours. But everything is fixed now, running smoothly and no data was lost! Normal service (i.e. more images over at the Photography Blog) will resume later this afternoon :-). So, big props to the folks at All-Inkl.com, where I’ve been a customer for ten years now – I’ve never had a problem and the few times I really had to ask the customer support about something, they were always enormeously helpful. And it’s not even terribly expensive – I consider about €86 per year for 100 gigabyte space, five domains and a lot more extras a very generous price! 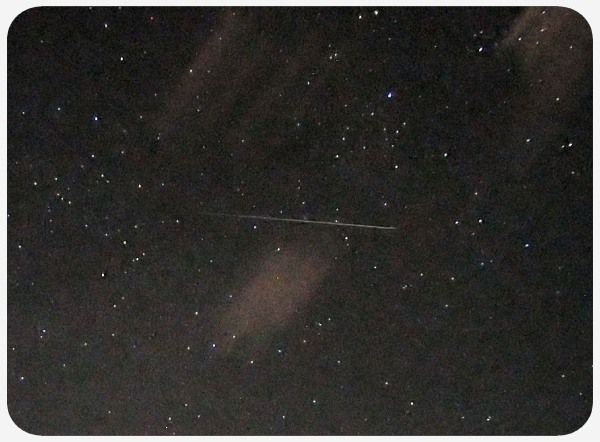 I almost forgot to write this blog post this year, mainly because our curse of the Perseid Meteor Shower seems to be creeping in again this year. Last night was semi-clear sometimes, but very hazy with occasional clouds coming through – I was lucky to have caught the “Supermoon” on camera, which is another reason the Perseids are hard to see this year. I don’t think the next few days are going to be better, so the usual date from August 10 to 13 with the evening of the 12th being the best chance, do not look good for us. It’s also unreasonably cold with barely 15°C at night or less, so sitting on the balcony to watch meteors might not be a clever idea. But if you have better weather in your location, here are some links from last year: If you want to know more about the Perseids, Universe Today has a really good Observer’s Guide written by David Dickinson and Fraser Cain has made a great short explainer video about meteors in general. In short, if you have a reasonably clear view of the sky to the east and northeast, you are all set to go! Please note that this is an outdated version of this article as of 1/1/2015. If you arrive here, please go to the new page. This is an index with the schedules some of the science, space and astronomy themed Google+ Hangouts I’ve been writing about in the Hangout and Podcast Recommendations before, only this will be updated more frequently. This is now the main hangout index after the version in the WSH Crew Community was retired in favour of a static list and the Google Calendar which now has all the dates. I will still try to keep this index updated as timely as possible and in sync with the calendar, but I cannot guarantee that I will always be able to catch all the updates. For corrections or suggestions, please use the comments here or on the related community post!